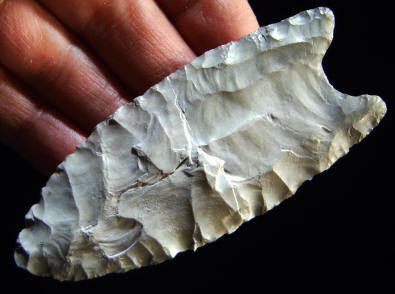 This fluted point was discovered during the excavation of the Lamb site in Genesee County, New York. It was found broken and it was reassembled from two pieces. One side is double fluted and the other side has one large flute. It's reported to be made from Ohio/Indiana chert and measures 3 11/16 inches (9.4 cm) long and 1 9/16 inches (3.9 cm) wide. The Lamb site is located in a cultivated field in Genesee County, New York on an inconspicuous knoll, barely six feet high, bordering Murder creek, a tributary of Tonawanda creek. The farm is owned by Christopher Lamb who surface collected the site adding to a family collection accumulated, over the years, by his father and grandfather. After studying fluted point fragments and preforms in the Lamb collection Dr. Mike Gramly of the Buffalo Museum of Science began excavation of the site in 1986 with volunteer help from the Houghton Chapter of the New York State Archaeological Association. Twelve fluted points and twelve preforms were eventually recovered. All material was found in the plow zone and no evidence of a storage or burial pit was found. It was determined that this material was either a cache by itself or at one time with a burial.